Centre for Fortean Zoology Australia: Thylacoleo roadkill in NSW? Paul Clacher has an interesting relatively new Thylacoleo sighting on his website - the proverbial dead animal beside the highway. Sadly no one ever seems to stop and take photos or collect carcasses! In December 2008, I was travelling south on the Castlereagh Hwy near Pearson's Lookout between the towns of Capertee and Ilford on the way back to Sydney after an overnight delivery trip through Orange, Dubbo and Mudgee in an 8 tonne rigid truck. No bonnet so I have unobscured vision. This is on the edge of the Capertee Valley and is about 900 - 1000 metres asl. The dropoff to the LHS (east) is steep to the valley. Late in the afternoon, say around 4.00 pm and about 200m south past the lookout, I noticed 2 X roadkill's on the southbound side just on the shoulder of the road. Doing about 80km/h, I had a 5 or 6 second look at a small dead roo and something else. The markings on the torso of the other animal were dark brown / black and the main colour was tan. The markings made me look closer and the carcass was intact. The ears were rounded, the head was stout and like a lion cub and the front paws were huge in comparison to it's body size. The back paws and tail were obscured because of the position it landed in after being run over. (probably feeding on the small roo). My first thoughts were of a small lion, but the dark marking's threw me. It was a thick set animal about 500 - 600mm long. For the rest of the trip to Sydney (2.75 hrs) I couldn't stop wondering what this thing was, and having told the story to several people, I still couldn't come up with a logical explanation. The story in today's Daily Telegraph regarding the Blue Mountains Panther made me check out for more info on the net regarding Australian big cat's / feral's, and my wife and I came across your page and pics of the Thylacoleo model at the Mt Isa Riversleigh Fossil Centre. This is what I believe to be the same animal, however it may have been juvenile due to it's proportions. 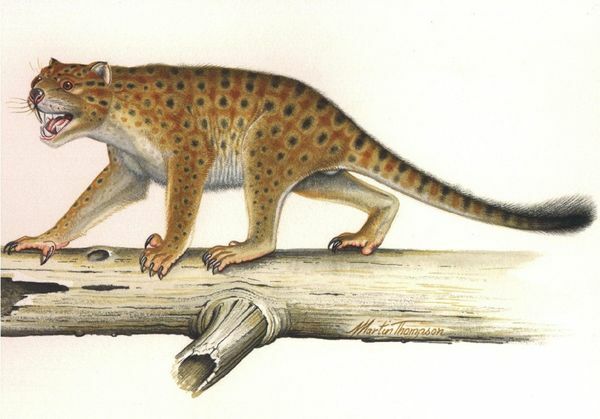 If this was an Australian Marsupial Lion, believed to be extinct for how many years, how many similar species are out there that are belived to be mythical? The abundance of roos and wallabies in this area is phenomenal, so a foodsource for a carnivorous predator to thrive in the Capertee Valley is probably salubrious. As I was driving on a log book, I couldn't stop as I would have ran over my driving hours, and didn't really consider the possible importance of the sighting. In hindsight, I wish I had turned around and stopped at the lookout and walked down to have a better look and at least taken photo's or thrown the carcass on the truck for an expert to identify.